It is said, or it ought to have been said, that every Conservative Cabinet minister dreams of dictating a leader to the Daily Telegraph. Nicholas Ridley, the Secretary of State fro Industry is, so far as I am aware, the only one to have done so. It happened when the late Jock Bruce-Gardyne, long-time writer of the Telegraph’s economics leaders, was staying with Mr Ridley. The then deputy editor of the Telegraph, Colin Welch, rang up to urge Jock to file a promised leader for the next morning’s paper. Colin Welch: Is that Jock? CW: Where is your leader? We need it now. CW: I’ll put you on to the copytackers. At which point Ridley delivered an impromptu pastiche of a Bruce-Gardyne leader, unfortunately too sureal to pass Mr Welch once he read it and divined its true author. After I had visited Mr Ridley in his liar, an 18th-century rectory in the heart of his Gloucestershire constituency, I could see why he should delight in such innocent deception. As we ate lunch together I stared through what I had thought was a window behind my host’s left shoulder. But it was in fact a magnificent trompe l’oeil, painted by Mr Ridley in 1961. The house’s – real – garden, designed by Mr Ridley, a civil engineer by training, is similarly baffling. One secluded section turns cunningly into another, and from any one fixed position it is impossible to see where the next turn might lead. But Nicholas Ridley’s passion for illusion is most definitely only a pastime. In modern political life there is no more brutal practitioner of the home truth. Not even Mrs Thatcher – whose own views owe much to his – is more averse to hiding the hard facts behind a patina of sympathy or politician’s charm. In a mirror world Mr Nicholas Ridley would be Mr Cecil Parkinson. Even knowing this, I was still taken aback by the vehemence of Mr Ridley’s views on the matter of Europe, and in particular the role of Germany. It had seemed a topical way to engage his thoughts, since the day after we met, Herr Klaus-Otto Pohl, the president of the Bundesbank, was visiting England to preach the joys of a joint European monetary policy. Mr Ridley turned his fire – he was, as usual, smoking heavily – on to the organisation as a whole. We were back to Germany again, and I was still the devil’s – if not Hitler’s – advocate. Somehow I imagined (and I admit it, because Mr Ridley is for ever accusing journalists of making things up) that I could hear a woman’s voice with the very faintest hint of Lincolnshire, saying ‘Yes, Nick, that’s right, they are trying to take over everything.’ I can at least recall, with no recourse to imagination, the account of one of the Prime Minister’s former advisers, of how he arrived for a meeting with Mrs Thatcher in a German car. ‘What is that foreign car?’ she glowered. ‘It’s a Volkswagen,’ he replied, helpful as ever. 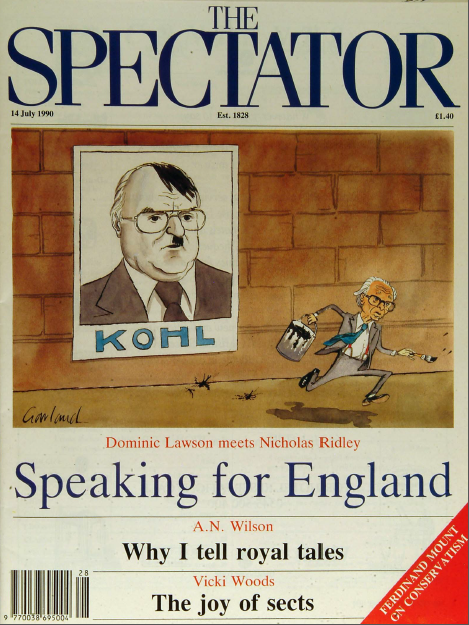 The point is that Mr Ridley’s confidence in expressing his views on the German threat must owe a little something to the knowledge that they are not significantly different from those of the Prime Minister, who originially opposed German reunification, even though in public she is required not to be so indelicate as to draw comparisons between Herren Kohl and Hitler. ‘Jolly good thing too. About time somebody said that. It was pretty nasty. Only two months ago I was in Auschwitz, Poland. Next week I’m in Czechoslovakia. You ask them what they think about the second world war. It’s useful to remember.’ It’s useful to know that Mr Ridley’s trips to Poland and Czechoslovakia are efforts, in the company of some of Britain’s leading businessmen, to persuade East Europeans of the virtues of doing business with Britain. How very annoying to see the large towels of Mr Kohl and his businessmen already covering those Eastern beaches. The rumbustious tone of Mr Ridley’s remarks and the fact that our conversation was post-prandial may give the misleading impression that the politician was relaxing, and not choosing his words too carefully. Far from it. Mr Ridley had the smallest glass of wine with his lunch, and then answered all my questions with a fierce frown of concentration, one hand clutched to his forehead, the other helping to provide frequent supplies of nicotine. At this point, Mr Ridley’s frown of concentration became an angry scowl, and to aid his pondering further he removed his spectacles and poked himself in the eyes with the ear-pieces. That certainly will be believed. Mr Ridley is still serenaded by the Right as the only minister to resign from the Department of Industry after Mr Heath’s famous U-turn of 1972. Mr Heath still insists that he sacked Mr Ridley. The truth – as usual in such matters – appears to lie somewhere in between. Whatever, it seems that only Mrs Thatcher changing her views on Europe – a nearly incredible proposition – would cause Mr Ridley to leave the Department of Industry in such traumatic circumstances for a second time. You can subscribe to The Spectator from just a £1 an issue.